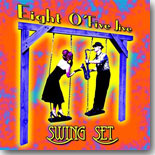 Swing Set is an appropriate name for the latest album from Nashville-based retro swing/jump blues ensemble Eight O'Five Jive, because that's pretty much what you get with this collection of 11 originals. It's a solid follow-up to their 2014 disc, Too Many Men, given a rave review by me in the September 2015 Blues Bytes issue. Like on their previous release, this band pumps out a whole lot of sound for a five-piece group augmented by horns from The Horn Stars. Ms. Lee Shropshire is again the star of the show, with a vocal style that harkens back to the big band blues era of the 1940s, although guitarist Andy Scheinman is also a master at his craft while handling a lot of different styles here. Rounding out the band are Patrick Mosser on sax, Bill Bois on bass, and Duane Spencer on cocktail drums (don't feel bad if you aren't familiar with this term --- I had to look it up). Among my favorite cuts on this disc are the jumping "Get Away," which will have you packing a grip to make that getaway with Miss Lee, and "Never," with really nice jazzy guitar riffs from Scheinman and a tastefully subtle bass line from Bois. One of the more frantic jump blues numbers is "My Mumblin' Baby," again showcasing Scheinman's hot guitar work and some equally superb sax blowing. The real showstopper on Swing Set is the really creative original "I Won't Wear Flats (To Your Funeral)," in which Ms. Lee gives us some very sassy vocals about that man who didn't treat her right. She tells him, " .... I won't wear flats to your funeral, I won't wear black to your wake, I'm gonna wear green with an elegant sheen, and my hair like Veronica Lake ...", and later adding that she's going to" ... wear red because you're going to be dead ..."
Ms. Lee really plays the scorned woman role well, as heard on "Watch out for Their Wives," complaining because her preferred man took his wife on vacation while she was out on sedation. Closing the album is a fun ode to alcohol, "A Little Bit of Bourbon," with that recurring line being followed by Ms. Lee singing "... it's a good thing I've got a lot ..." This number builds to a cacophonous ending with every backup vocalist joining in on the blues shouting and plenty of big saxophone. OK, Eight O'Five Blues, you've hooked me. When can I expect you to come to my part of the country? Until then, I'll keep jumpin' and jivin' to both of your fine, fine CDs.